I created some fliers to post around in person as an unconventional method of attracting new bird owners seeking help. I understand that employees at bird stores cannot provide a new owner with all the answers so it is my hope that they try to educate themselves. It all starts with buying a book and searching the internet. However, eventually owners just need to be able to talk to other owners to be able to compare experiences and ask questions. This is the reason I started The Parrot Forum. Anyone can help spread the word. Whether you work at a pet store, know people with parrots, or just visit a pet store to pick up some supplies, you can spread the word by posting some parrot forum fliers. All you'd have to do is print a few out (color if possible) and cut between the tabs at the bottom up to the line so people could rip them off and remember the URL. Some stores have a bulletin board for posting missing pets and whatnot so I bet its no problem just putting it up like that. If not, you can talk to the manager/owners and tell them about it. Not only might they let you post it but maybe they'll recommend the parrot forum to their customers. If a customer just bought a bird and has a lot of questions they are too busy to answer, they can recommend the forum to them to learn more about their new bird. So if any of you have the chance, please post some of these at bird stores and events you visit. 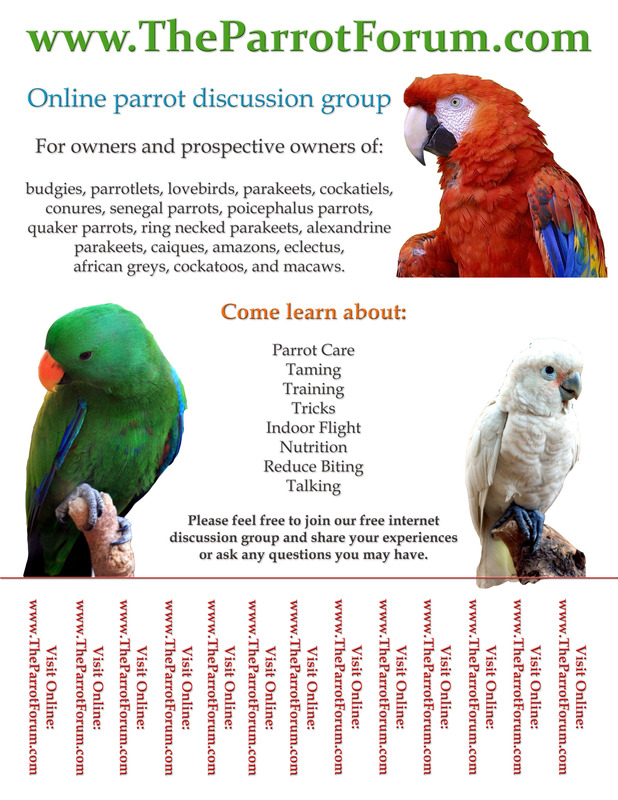 If you work at a pet store, are a breeder, or are a member of a parrot club, you could mention the forum to new parrot owners as a source of information beyond what you can answer. We appreciate all of your help making the forum a success. thanks, great idea. don't have a printer hooked up at my house but will soon. will let u kno if i get any out. I only saw this post now but i'm going to put up 3 posters around town! I think this site and the Trained Parrot Blog are very helpful, and Im doing this because I want other birds to be looked after properly.